Do you ever wake up in the mornings and think how blessed are we to wake up with a view like this? The sun was shining in so big and bright this Saturday morning. Had to snap a picture and share with all of you. Enjoyed lunch with a great new friend today at a little restaurant beside our place. We didn’t know what was in store for us. We have walked and drove past this place nearly everyday since first arriving in Korea. At this point we were going off purely what our noses led us to believe. We plan to go back again after filling our tummys with spicy kimchi filled mandu, a noodle-seafood soup, and some typical Korean sides. Wowie! The kimchi mandu had a kick to it, but were super delish! Going into the meal blindly, does this look like something you would try out? Guess you can say we Bees are continuing to expand our food horizons. 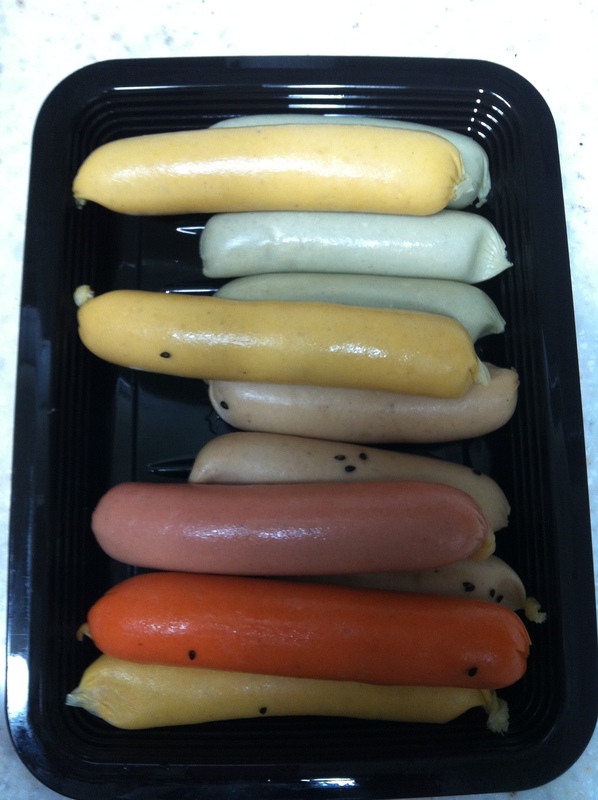 Ha,ha,ha…we really are not sure what type of sausages these are from Lotte Mart. But, we are just about to find out…. Foodie success! The green ones are our favorite! Bet you never would have guessed that they are the spicy ones. Anyone living or visiting Korea ever tried Bungeoppang (붕어빵) ? When Mrs B arrived in March she immediately started to compile a list of things she wanted to do or try before she ever left Korea. You guessed it, these delightful little fish pastries made the list. We Bee’s were out an about on Sunday afternoon and we found a vendor selling them! Plus they give you three for 1000 won, STEAL! So what is Bungeoppang? As you can probably see from the above picture, the outer layer is a batter consistency that has been cooked in a metal fish-shaped iron. The outer layer taste much like a pancake or waffle. Now what you cannot see by looking at the picture is what bungeoppang is filled with. The center is sweet red bean paste, come on… this is Korea…what else would it be filled with? It’s funny to say “sweet” because it’s really not a sickening sweet taste, but rather a mild sweetness. (Struggling to describe the experience in exact words). YEY! We get to cross another item off the list 🙂 If you are out and about and see a vendor selling these, try it out! Let us know what you think. Nihao! nihaoma? (Hello, How are you?) Yes! We Bee’s are writing to you from a different part of Asia! Beijing, China to be exact. We woke up at O-Dark 30 to catch the bus down to Gimpo International Airport. We flew Korean Air (Oh-Yeah buddy!) and were served an inflight lunch that consisted of chicken, rice, and some sides. The flight time was about an hour. The great part about it all is that China is behind Korea in time by an hour. When we landed we had to make our way through customs and baggage. It took our group a bit longer because we consisted of 15 people and two babies. Once the final person cleared baggage claim we caught our tour bus and got to meet our tour guide Shelly. Shelly was outstanding and if we ever do any more trips to China she will be the first person that we link up with for suggestions or private tours. Shelly was given her English name when she was much younger because her Chinese name sounds so similar. Shelly spoke excellent English and really knew what Americans were into seeing and trying out while on a trip in China. Once we left the airport we went directly to grab lunch at San Shi Jian a Cantonese Style restaurant. We took some pictures. We felt that the place was a bit touristy but all and all we enjoyed it. We were excited to be eating real chinese food from China and in China! Come on folks, it’s the little things in life, right? Driving through downtown Beijing we quickly noticed how clean everything was. The streets were much wider, and people actually obeyed and followed the traffic signals, imagine that! (cough, cough, Korea). Most of the streets are also lined with weeping willow or poplar trees. Shelly stated that on March 12th (known as National Tree planting Day) China will plant tons of these two types of trees because they grow rather quickly and also help to cut down on the yellow dust. After lunch we took our first tour at the Forbidden City. We were warned to keep our handbags and backpacks close to us when we were in large groups of people due to the pickpocket’s. Luckily our group didn’t encounter any issues with this. Forbidden City, also known as the Palace Museum, is one of THE have to do when in Beijing destinations. The grounds are enormous covering over 720,000 square meters! There are a total of 9999.5 rooms (Our tour guide told us because only heaven could have 10,000 rooms). Forbidden City was home to the Ming and Qing dynasties. We were told that construction of the Palace began around 1407, with a million construction workers helping to construct the site. More than 20 Emperors were said to have lived in the Palace and overtime an incredible collection of treasures and artworks were able to be preserved. Sadly, the Palace burnt to the ground when Manchus evaded it in 1644 as well as being looted on a handful of occasions over history. Don’t worry there is still a ton to see. Our tour guide Shelly said that “forbidden city” translates into a Chinese term 紫禁城- Zījĭnchéng, because ordinary people would be punished by death if they found their way into the palace uninvited. The Forbidden City is also referred to as 故宫 – Gùgōng. Walking through courtyard after courtyard we ended by coming out of the palace and walking along the moat that is towered by a 10m high red wall. Simply incredible! After touring Forbidden City we made our way to Tiananmen Square because it serves as the main entrance to Forbidden City. Tianamen Square was built between 1368 and 1644. When it was first built it was referred to as Chengtian Square. The word Chengtian means that the emperor was appointed to govern the nation by Heaven. The square has gone through many changes over the years. Today Tianamen Square serves as a symbol of China, so much so that it was designed into the Chinese national emblem. By now our group was lagging behind the tour guide and legs were staring to ache. We loaded up the bus and went to a theater where we got to see a Chinese acrobatic show. Everyone enjoyed the performances. The most impressive act was when 4 motorcycles drove into this small cage one by one and were able to keep driving without running into each other or wrecking. Not the traditional Chinese culture but still very entertaining. By now the theater was warm and dark, the perfect napping environment. Mrs. B’s eyelids were heavy but impressively she made it through the entire show. Again, we loaded up our group onto the bus and went to the Rainbow Hotel Restaurant for a famous Chinese dish called the Peking Duck Special. Mr. B and I were very curious to see how the peking duck stacked up against the Korean duck dish. Our guide Shelly tried to explain what the dish would be like and how you were to eat it before getting to the restaurant. I think at this point the group was just saying, “give me food! I don’t care what it is, i’m just hungry!” ha-ha! The lobby of the Rainbow Hotel as well as the restaurant area were very nice. The service was quick, because our large group had a reservation and pre-ordered the foods. The peking duck had a pretty crispy skin, fairly juicy meat, and was sliced neatly on the plate. To eat the duck, you take it with the sliced cucumber and hoisin sauce and wrap it in a thin pancake. Honestly and disappointingly we have to report that we were not impressed. To be brutally honest, we would have preferred Korean duck. We have not totally written off the peking duck and if we come back to China we will surely give it another go, just someplace else. After dinner we checked into the Beijing International Hotel. Everything on our first day was at most 30 minutes away from the next spot on the itinerary. We took the elevator up to the 5th floor where our room was, opened the door, and immediately were drawn to the downtown view of the city, traffic, and lights. We couldn’t have asked for a better room and view! We cannot believe it’s already day two of our vacation in Beijing! I guess it’s true what they say, time flies when you’re having fun! We had a wake up call from the hotel at 6am. got ready and went downstairs to the hotel restaurant for the breakfast buffet. Outstanding food! There was something there for everyone. Asia is not a breakfasty culture like America. We enjoy our milk cereal, pancakes, eggs, sausage, ham, etc. Nevertheless the restaurant did a great job at covering everything in between. After breakfast we loaded up the bus and went to a Jade carving museum and factory. Mr. B talked Mrs. B into purchasing a Jade bangle for herself. In China, Jade is said to be a gift from heaven that links earth to it. The green color represents loyalty, and the Chinese culture wears the pieces for good luck to keep them away from harm. The sales representatives really did a great job telling you how amazing a piece looked up against your skin tone. When parents and children entered into the showroom they would explain how if they bought a bangle they could do as the Chinese parents and give their daughters and sons jade bracelets to protect them. Parents also would give the piece as a symbol to remind the young of their parents’ eternal love and protection. Once back on the bus the entire group was talking about how much revenue this place must take in. There were busses pulling in and out of the parking lot the entire time we were there. We learned fairly quickly that the Chinese government had some sort of cut into the revenue these places took in when foreigners came for a tour in the city. Pretty smart!! Eagerly our bus headed for the Great Wall. Again, not much of a drive from where we were when visiting the Jade museum. For starters, we were told that the month of October is one of the best months to visit the wall, and we arrived with nice fluffy white clouded skies, absolutely perfect temperatures, and a crystal clear view of the wall that was twisting and towering over the mountain ridges. There was a bit of wind, but we embraced it as we started to hike our way up the wall. It was in a word, stunning! 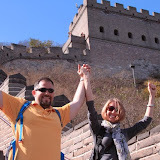 We were told there are sections of the Great Wall that you can take a chairlift or gondola up. Neither of these options were available where we started hiking. The two options to our group only consisted of the easier or harder route of the wall. We Bee’s are glutton for punishment and took the hard route and proudly huffed and puffed our way up and through three towers of the wall. At last! It felt so good to witness in person something so incredible! We jokingly said that we remembered sitting in an American-Chinese Restaurant looking at the Great Wall map on a placemat never quite imagining that we would actually see it in person! We hiked up, and up, and up, and up. We just kept saying one step at a time. Our Legs were stinging a bit and knees were cracking…but we can finally say, WE DID IT! WE HIKED THE GREAT WALL!! (Special note to Mrs. B’s Grandparents, no flip-flops were worn while hiking). After the Great Wall we were all beat! At this point our group was ready to relax and take it easy. Shelly our guide made us press on with the itinerary. Next stop was for lunch at the Friendship Store where we enjoyed a mixture of Chinese foods. Once again our group was ready for a feast because of all the energy we used hiking the wall. After lunch we went to the Summer Palace of the emperors. This is where the royalty used to stay during the high heat seasons. Just when we thought we had seen all the best things that Beijing had to offer we pulled up the Summer Palace. The guide quoted the grounds as, “A masterpiece of Chinese landscape garden design. The natural landscape of hills and open water is combined with artificial features such as pavilions, halls, palaces, temples and bridges to form a harmonious ensemble of outstanding aesthetic value.” We would have to agree with our guide, the grounds were breathtaking. The palace construction started in the 1750’s. Of course the structure was destroyed by a fire and was rebuilt in 1888. Our guide stated that it is said Empress Dowager Cixi used the Summer Palace to embezzle navy funds to reconstruct it into a resort, so she would be able to live out her life there. Unfortunately for her in the 1900’s Summer Palace was attacked yet again, by the Eight Power Allied Force. Afterwards it took China only about two years to recreate the structures. Today the grounds stretch an area of 742.8 acres. When visiting you will be able to take in over 3,000 man made ancient structures, each one more incredible then the one before. We walked through corridors, pavilions, towers, and the seventeen-arch bridge. The entire vibe of the place is calming and peaceful. Walking around Summer Palace we took in the sun beaming off the lakes smooth waves, and the wind blowing the weeping willow leaves so gently. After feeling calmed by the Summer Palace we loaded up the bus and were on our way to the Pearl Factory and dinner. There wasn’t much to say about the Peal Factory. We learned a few new things about the pearls that could be purchased in China. There were some beautiful things that some of the group purchased but we Bee’s just weren’t into it. Dinner was at Tai Yi Chun and it was a lot like the first day of the trip. Nothing special to write home about. 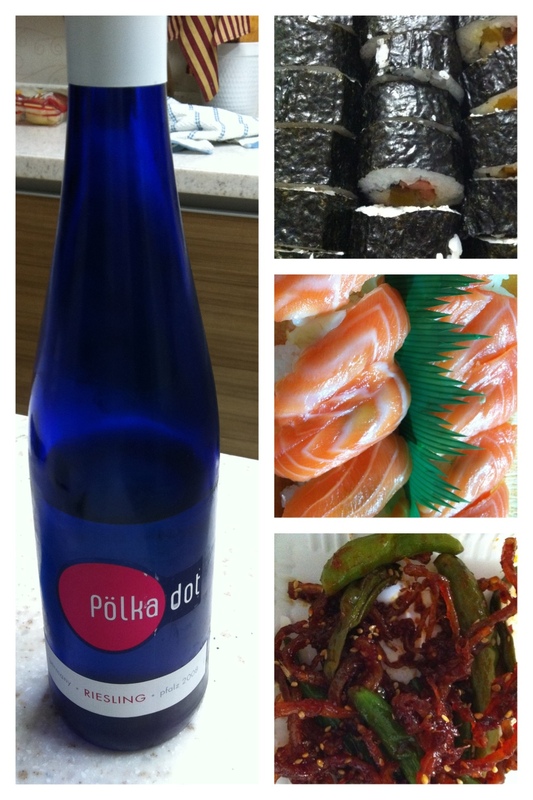 We even actually missed our Korean cuisine. Funny how that happens, right? After dinner we went to Wangfujing street. When we were getting off the bus our guide warned us of young girls approaching the single men in the group asking if they wanted to practice english with them. Our guide told us that on a few of her tours young men fell into the trap. These young girls would seem very nice and well educated and would say they want to learn more of the english language and would invite the person to go to cafe or bar, the young man agreed and they took him to a bar near wangfujing. After only one hour they drank a little and they want the young man to pay, the bill ends up being 2000 yuan for a small order of drinks. A total scam! Shocked and half laughing we were walking down the street together and Mrs. B went off to purchase fruit on a stick covered with a clear thick hard sugar. Like Bee’s the young ladies approached single Mr. B and wanted to practice English with him. He told them they better run because Mrs. B was on her way back over. HA HA! Only us! Wangfujing was a street that our friend David said we absolutely had to try to see for him. So now you are wondering what is so special about this street? Well, for starters it’s a very popular vendor tent lined street where one can eat all sorts of crazy “things”. Starfish, testicles on a stick, scorpions, seahorse, whole crabs, corn, worms, crickets, dumplings, fried ice-cream, noodles, snake, whole coconuts, millipedes, lizards, liver, heart, cotton candy, larvae, etc. Yes, a plethora of crazy odd “foods”. We played it safe only going for the sugary fruit. A few of our daring group members ate the scorpions. Of course we took pictures and got it on film for all of you! After our adventures on Wangfujing street we went back to the hotel and crashed. Day three of our Beijing adventure we woke up bright eyed and bushy tailed. Kidding, we crawled painfully out of bed! We started the day off with our morning breakfast at the Hotel breakfast buffet. Loaded up the bus and went to the Temple of Heaven. The Temple of Heaven also known as TianTian is where the emperors of the Ming and Qing dynasties would make offerings to the heavens and pray for a bountiful harvest. What we enjoyed most about the grounds was the three tiered round shaped building. beatifically colored with a blue tiled roof. We were told that the number three and number nine repetitively recurred in the layout of the design of the building. The number three because it is the square root and has a natural resonance in terms of the beginning, middle and end. The number nine because it was the highest value digit associated with the emperor. *Ginseng Oolong Tea- For one person, put one teaspoon in the cup, pour in the boiling water and you can reuse 5-6 times throughout that day. The tea is good for memory, energy, and helps prevent kidney issues. *Pu’er Tea- For one person, use half of the tea piece, pour in the boiling water and you can reuse 7-8 times throughout that day. It is good for loosing weight, lowering blood pressure, blood sugar, high cholesterol, and diabetes. *Litchi Black Tea- For one person, put one teaspoon, pour in the boiling water and you can reuse 3-4 times throughout the day. 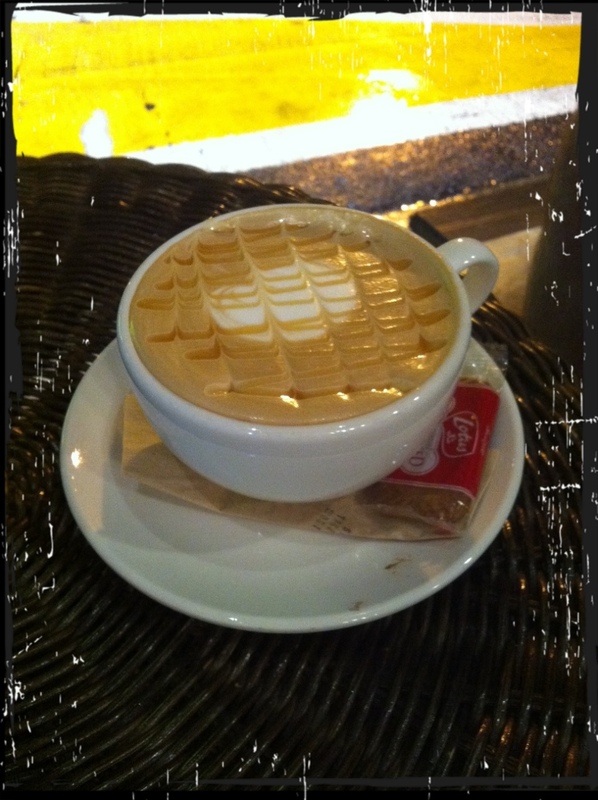 It is good for anemia and warming the stomach. *Jasmine Tea- For one person, put one teaspoon in the cup, pour in the boiling water and you can reuse 3-4 times throughout the day. It is good for your eyes and liver. Jasmine tea is also good for sleeping and headaches. *Green Tea- For one person, put one teaspoon in the cup, pout in the boiling water and you can reuse 5 times throughout the day. It can clear the mind, and can help prevent cancer. After the tea splurge we went to the silk quilt factory. We learned the process of how silk is made. Very interesting but we won’t go into any detail on it. We ate lunch at a local restaurant that was Sinchuan Style. Again, nothing major to write home about. 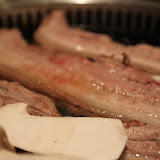 We did favor some of the side dishes, again missed our korean cuisine. After lunch the rest of the day was our free time. We had our guide write our various spots that we were interested in going to see. 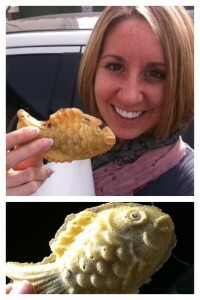 First we visited a marketplace that was total trademark rip-off. You could purchase any brand under the sun. Incredible how crafty the Chinese are. Oh, and prepare to haggle a price…start off at least with 10% of the asking price. These marketers see you a mile away but stick to your guns and you can walk off with some pretty great deals! After the marketplace we went to Hard Rock to pick up a keychain and tee-shirt for our dear friend Scott. We continued on with our taxi ride to Hou Hai. Our guide said this is one of her favorite areas to see old Beijing meeting new. At first it didn’t click. We started off very excited with the man made lake area and lights and saw a Starbucks. We just didn’t see how this was old Beijing. Surely we misunderstood? Nevertheless we stumbled upon an awesome stone brick pizza place. We ordered gorgonzola and honey pizza, A-MAZING! Our friends ordered a traditional pizza with meats, veggies, and cheese, E-XCELLENT! The men washed down the meal with a ginger-beer. Mr. B was so impressed and asked the waiter how it was made. He let us in on the secret……come on… we have to save somethings. After dinner we walked around the lake more, grabbed a huge cotton candy, and walked more. Eventually we came to an area that started to look more like restored traditional Chinese structures. Ahhhhhhh, so this is what Shelly meant by old Beijing meeting new! After the lake we wanted to see the Olympic Stadium Bird Nest Structure. Sadly, we didn’t make it to the structure in time to see it all lit up. Luckily we snapped pictures during the day of the structure. So that made two things that we didn’t get to accomplish on our Beijing list. The first being catching a rickshaw ride, and the second being seeing the Olympic Stadium up close. Day four concluded our Beijing adventures in China. We woke up ate breakfast at the hotel and packed our belongings into the bus. We had a wonderful flight back “home” on Korean Air to Gimpo International Airport located back in South Korea. The flight wasn’t packed and it allowed our group to spread out all over the plane. Hope you enjoyed reading our blog as much as we enjoyed doing and reporting back. Until our next big trip….. stay tuned for the video to be posted! This weekend it’s hit us…it’s really time to let go of summer and reluctantly say HELLO to fall! As we have mentioned the past few mornings have really let it be known that Fall is truly here to stay. We wake up and the morning air is so crisp and cool. The leaves and bright shades of mountain greens are noticeably fading and taking on red and yellow hues. Mr. B mentioned that the summer morning birds and bug sounds have quickly lulled. He said fall and winter to him is more of a calming time because it’s so quiet. What an interesting perspective… I guess he’s right… We tend to typically “nest” during these next upcoming months. 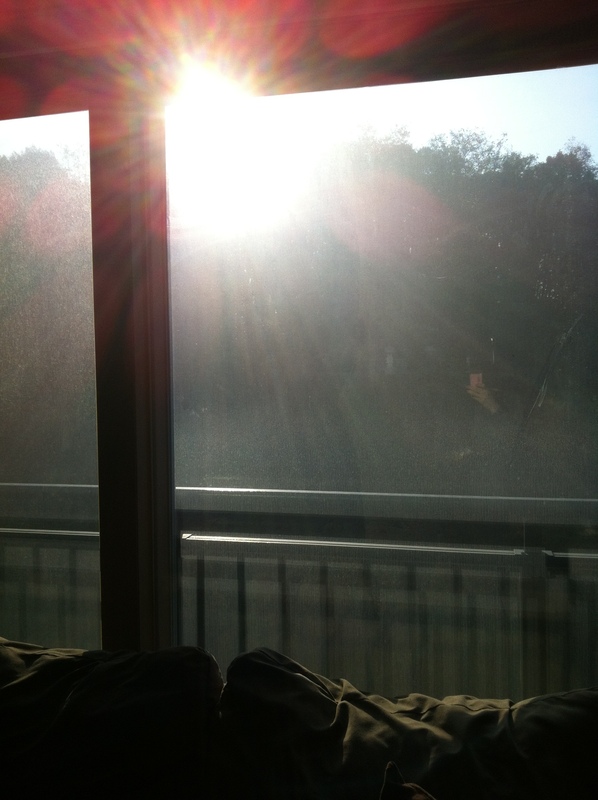 So yesterday on a beautiful early fall morning we woke up to catch a bus to Gongju City. We were invited to experience an overnight stay at the Magok Buddhist Temple and take a tour of the city. The city of Gongju paid a portion of the trip for foreigners! How great is that?! 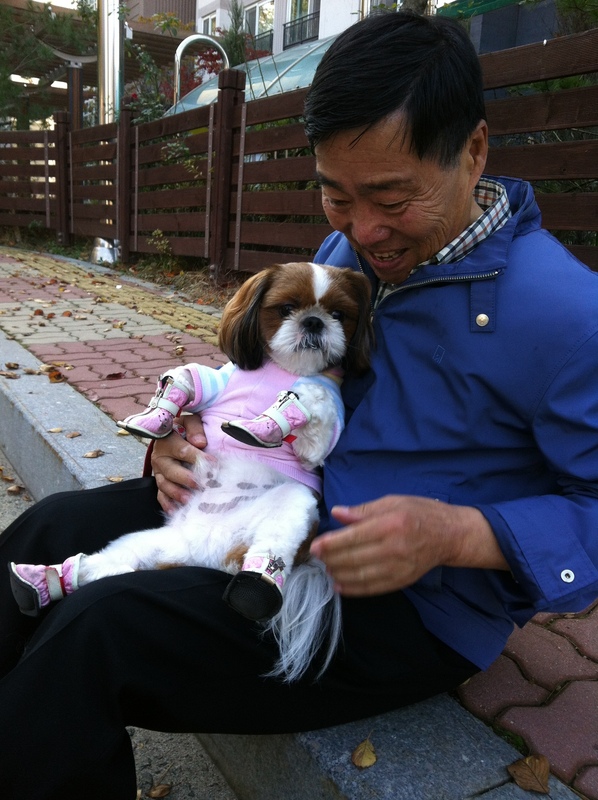 Gongju is located in the center of South Korea and is south of Chungcheong Province. The city is best known for being the capital of Paekche kingdom from 18 B.C to 660 A.D.
Today Gongju features artifacts and replicas that depict the historical and cultural places. These are, the Buddhist temples, parks, museums, villages, tombs, fortresses, and so much more! The city takes great pride in extending a hand to outsiders and foreigners to see just what their city has to offer. On our trip we spent the night at the Magok Temple. The temple is a 300 acre facility that can house 200 people at a time. (wow) Also we were warned that we may not have beds as most Buddhist monks do not. Our group is was interested to see what was in store! Once arriving at the temple we got off the bus and headed down a beautiful stone path lined with tons of wild flowers. It was just magnificent! Breathing in the clean country air, taking in all the secluded wilderness! Ahhh!! What peace! We walked until we came to the various temples. We were told a story about a little bell that was affixed to the side of a statue. The tour guide told us that the bell only rang once. That only time it rang was when Japanese were invading. After we spent sometime walking around the area we went to check into our temple stay. We were really surprised to see that the temple complex where we were to stay was very modern and sleek looking. We were given our room keys, again shocked, we had individual rooms with a private bathroom! We were given our monk attire for the temple stay. Sooo the monk attire, Mrs. B’s was to way big and short and Mr. B’s was a tad to small. It was very obvious that these were Korean sizes. After we danced around in our room with our new attire we unpacked a bit and headed back to meet up with the group. We started out with a nice welcome and an overview of the temple stay. We then made lotus flowers. Mrs. B’s lotus ehhh not so nice, we now know her future isn’t in the lotus making industry. Mr. B, of course was the Martha Stewart of the table and kept getting complements from the Monks. After making lotus flowers we went upstairs to the mediation room. Here we learned some yoga moves, and how to meditate. We also eventually learned fighting moves. Oh yeah! Watch out! We took a break and went for dinner. Our group was rather pleased with the dinner buffet in the cafeteria. 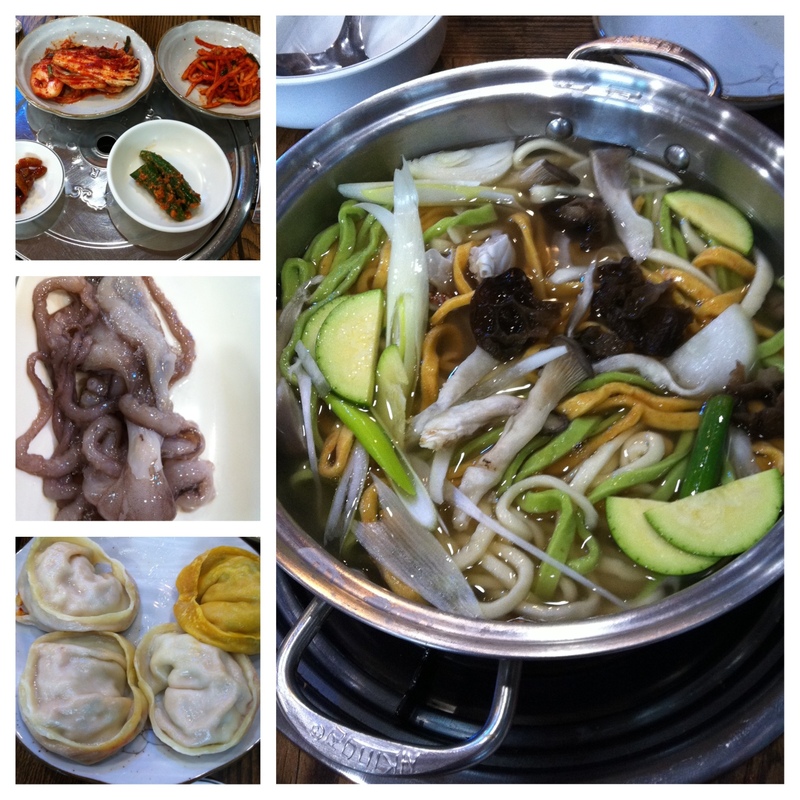 We had all types of different Korean dishes. What a treat! After dinner we went back to the meditation room and learned about the 108 beads that Buddhist monk wear. We also learned how to properly preform 108 bows. After a long day we were beat! We headed off to bed on our floor mats. Maybe it was a long day and we were drained, or maybe it was actually comfortable? We both agreed we slept great on our floor-mats! 7 AM came rather fast and we went down for breakfast, hung our mink attire up, turned in our keys, and loaded back up the bus with our baggage and body’s. We departed for the tour of King Muryeong’s Tomb and ceramic shop. We learned the tomb was excavated in 1971 and also featured various real artifacts. We were impressed with the huge tomb mounds! Check out the pictures. After touring the tombs we then took a tour of the Gongju museum. The tour included a royal fortress experience where we partook in the Paekche Royalty costume fitting. Back to the museum.. It housed 2,906 artifacts from the excavation of King Muryeong’s tomb! It was really neat to see all of the gold and metals that were found from that era. Next we went to the Gongsanseong Fortress. The Fortress featured a mud castle that is 400 meters long as well as a stone castle that is 2,260 meters long. During our time at the fortress we were lucky enough to witness the change of guard ceremony and of course snap some pictures and video. We decided we want to go back at night to see the grounds and gather a different perspective of the area. 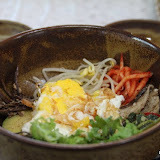 After touring we went for lunch and ate at a bulgogi restaurant for lunch. It was actually delish! We typically don’t care for bulgogi because it can be overly sweet. This place had it perfect! Plus they treated us to a shot of the areas well famous chestnut makkoli (instead of the regular rice wine makkoli). After lunch we went to Seonggok temple. Seonggoska mountain park features the tallest Buddha statue in Asia! It ranges 177 feet!! It was HUGE! Plus we got to see an arena of 1000 golden Buddha’s. What a sight! After Seonggok we loaded up and were on our way back to Dongducheon. We stopped once at a rest stop. We grabbed some strawberry gelato and hodduk. Mmmm! What a sweet ending to an awesome weekend!